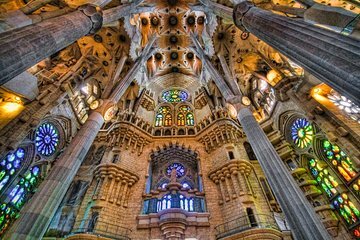 Profitez d'une visite privée de 4 heures axée sur la famille et qui vous conduira dans deux des meilleurs sites Gaudi à Barcelone: la Sagrada Familia et le parc Guell. Commencez par explorer la magnifique cathédrale de Gaudi, la Sagrada Familia, et découvrez son histoire et son symbolisme. Continuez en taxi jusqu'au parc Guell où vous verrez la section des monuments, qui contient des structures fantastiques de Gaudi et des fontaines où les enfants peuvent jouer. Our tour guide, Esther made these experiences that much better. We learned so much and her personality was inviting and fun. We would not have learned half as much about La Sagrada Familia, Park Guell and Antoni Gaudi had we not hired this private tour. And that the company was able to accommodate us when everywhere else said we were unable to get tickets, made us feel taken care of. We highly recommend Viator and Esther! Our tour guide Anna was as sweet as she was knowledgeable. She was very informative and engaging, especially with our 12 year-old son. The Sagrada Familia is breathtaking and Park Guell was very interesting. I would definitely recommend this private tour and these sights. Thank you Anna! NOT A GOOD TOUR FOR YOUNGER KIDS. We have 2 small children. Age 6 and 8 We were hoping this would be a good tour to keep them occupied while seeing some of the amazing sites Barcelona has to offer. The tour is packaged as a family tour making it sound like the perfect combination of culture and kids friendly activities. Unfortunately, that was not the case. Our guide was very knowledgable and nice, but not entirely kid-friendly. She spent the majority the time talking to our kids good, but her words and content were not very fun or kid-oriented not so good. The Sagrada Familia tours lasted about 2 hours. The majority of it was done outside in the heat. There was much conversation on the details and meaning behind every statue and carving on the facade of the church. While I found it interesting, it was more like torture for my kids. Every time our guide looked away, my kids would give me the moon eyes and say Can we go home now???? We ended up skipping the 2nd half of the tour because the kids were so bored that we just didn't think they could make it the entire way through. Which broke my heart because Parc Guell was one of the main things we really wanted to see on this trip and were unable to get tickets at all this trip. But the kids were so thoroughly done by that point, it was not possible. I think if we had older kids, or adults, this would have been a great tour. Any kid under 10 or 11 would find this a boring trip. This was the most expensive thing we did on this trip -and it was a huge disappointment. If you have small children, do not book this tour. A must to see in Barcelona. It was great to see both in one day. Guide was fantastic and helpful, very knowledgeable. Worked with us to make the tour exactly what we wanted. We would have liked the option to have purchased tickets to climb to the top of the church.